MDSU Exam Form 2019: The Maharshi Dayanand Saraswati University has released its examinations forms for the Nov Dec Examinations. The students can apply for the MDSU Ajmer Exam Form 2019. The controller of the examinations has updated the link for the submission on the website of the University i.e. mdsuajmer.ac.in. 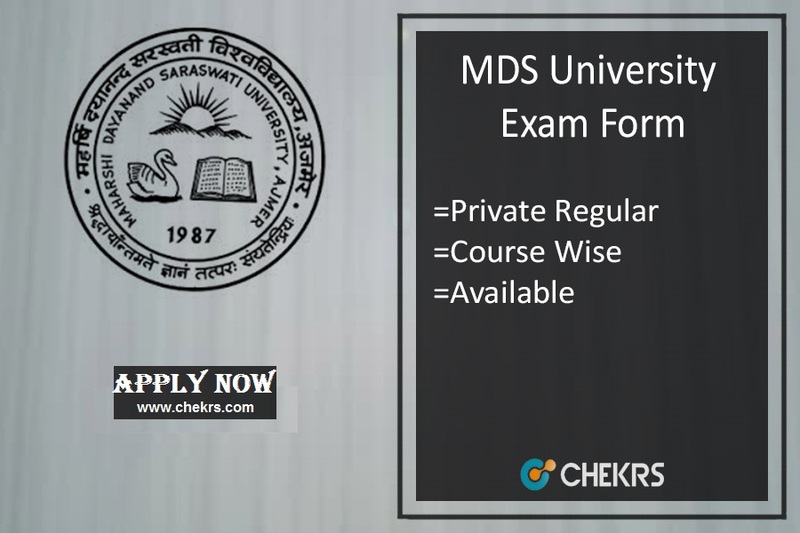 We have also mentioned here the direct link fro the online applications of MDS University Exam Form 2019-19. The students who will fail to submit the form before the due date will not get eligible to appear in the final examinations. Latest Update: Check here MDSU online exam form 2019 from the table provided below. The authorities will conduct the exams in Nov month and the links fro the examination form has been activated on the official website mdsuajmer.ac.in. The students can check the MDSU Exam Form Last date 2019. The forms have been released from 20th November and the last date for the submission of the form without late fees is 30th November. The aspirants who will fail to submit the MDSU Private Exam Form between these dates, they have to pay the fine of Rs. 100 from 1st to 10th December to submit the exam form. The details and instructions for the submission of the form are mentioned in the pdf given in the article. The MDSU BA Exam Form 2019 will be released commonly for all the courses. The students can apply for the MDSU Exam Online Application Form course wise. The authorities have updated the link on the official website. The students just have to follow some precise procedure for the checking of the MDSU Exam Form Filling Last Date and to submit it successfully. The last date to submit hardcopy along with the fine is 16th December. The fees will be paid through the challan to the respective bank. Steps to submit MDSU Exam Form 2019. The students have to open the official website i.e. mdsuajmer.ac.in. Then they have to click on the student’s panel. Now click on Exam Form 2019. Enter your valid application Number. After submission, the form will be shown on the screen. Download the form by taking a print out. Fill all the required details in the form of name, course, year etc. Attach the photocopy of challan along with the form. Submit the form at the University campus before the due date. After the deadline, the forms will be submitted only with late fees. The students can also click on the link we have mentioned for the ease of the students. The Maharshi Dayanand Saraswati University is located in Ajmer. A large number of students are going to appear for the examinations. They can download the MDS University Exam Form. The form will be submitted only by offline mode at the University campus. But the aspirants can download them from the official website. The aspirants submitting the form after the last date have to pay extra fees for the form. For feedback and more queries regarding MDSU Exam Form 2019, you can contact us by commenting on the comment section given below.